I’m a bit late on this post for the Taurids, the election has me mind in other places. Luckily the show is not over, in fact we maybe just in time for some midnight fireballs. This all because the Earth & the Moon will be passing through a swarm of debris left over from the parent comet 2P/Encke between Nov. 5th and 12th. 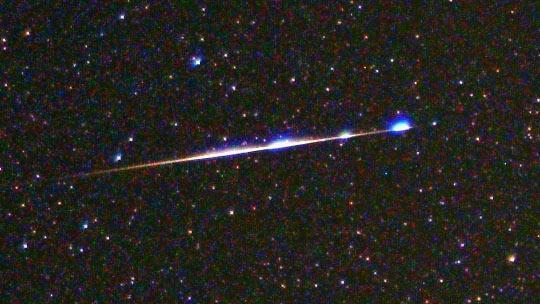 The same type of swarm event happened in 2005 and observers reportedly observed “midnight fireballs” for nearly two weeks. The swarm, which probably coalesced into a cluster due to gravitational tugs from Jupiter, orbits the Sun every 3.4 years. That means the Earth does not intersect it every year. This year, however, our planet will make a glancing pass through the group. “It should just be within what we think is the extent of the swarm,” says David Asher of Armagh Observatory in Ireland. The constellation Taurus is where the Taurids appear to originate from will rise at sunset and stay high in the sky all night long. On the heels of the less spectacular Taurids we have the Leonids which generally begin around November 13 and end on or around November 21. Historically, the Leonids are the ones to watch, they have produced some of the greatest meteor showers but this year they will be competing with a bright waning gibbous moon, not an idea situation for viewing. The maximum viewing window for the Leonids is generally during the nights of November 17 and 18th. I have seen leftover stray meteors as late as Thanksgiving.